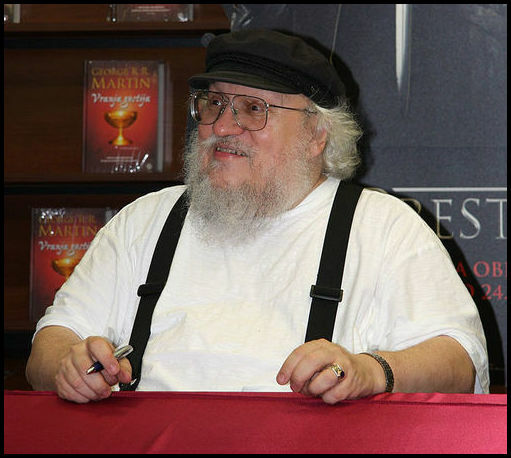 George Raymond Richard Martin (born George Raymond Martin; September 20, 1948), also known as GRRM, is an American novelist and short story writer in the fantasy, horror, and science fiction genres, screenwriter, and television producer. Martin is the bestselling author of several novels, including the acclaimed series “A Game of Thrones” which in 2013 alone sold 1 million copies. His book series was adapted into a TV series on HBO and the first episode aired in 2011. Millions of people tune in to watch the hit show and some episodes have even been viewed by over 18 million people. A few of Martin’s bestselling books. A reader lives a thousand lives before he dies, said Jojen. The man who never reads lives only one. I was curious to learn which books Martin enjoyed throughout his life, so I did some research to find out which books the famous author recommends. Here is the list of the 20+ books George R.R. Martin recommends reading. Outlander is one of the best shows on television, a wonderful blend of historical drama, science fiction, fantasy, and romance. Larson is a journalist who writes non-fiction books that read like novels, real page-turners. This one is no exception. A Song of Ice and Fire draws as much on the traditions of historical fiction as it does on those of fantasy, and there are many great historical novelists, past and present, whose work helped inspire my own. Sir Walter Scott is hard going for many modern readers, I realize, but there’s still great stuff to be found in Ivanhoe and his other novels. Armada, like Ready Player One, is a paean to the video games of a bygone era, and like Ready Player One, it is a tremendous amount of fun for anyone who remembers that time and played those games. Since I know there are a lot of fans of military [science fiction] out there, I’d say that Angles of Attack might actually have an outside chance at earning a genuine Hugo nod solely on its merits… In any case, Kloos is a writer to watch. Fantasies are not the only books I recommend to my readers, however. It has always been my belief that epic fantasy and historical fiction are sisters under the skin, as I have said in many an interview… there’s still great stuff to be found… in Sir Arthur Conan Doyle’s The White Company (he [wrote] more than just Sherlock Holmes). I’ve also really enjoyed a nonfiction title from a couple of years ago called The Beautiful Cigar Girl by Daniel Stashower, which is simultaneously a bio of Edgar Allan Poe and a ‘true crime’ account of a sensational NYC murder case that inspired him to write The Mystery of Marie Rogêt. Call this one history or biography if you must, but it reads like a novel… and I especially loved the stuff about the New York City press, one of my obsessions. Whether you want something else to occupy your time while waiting for The Winds of Winter, or you’re just looking for a good read… you won’t go wrong with Maurice Druon, France’s best historical novelist since Dumas Pere. Stephen King was big for me in 2013. I really liked Doctor Sleep, the sequel to The Shining... but I actually liked Joyland even more. Set in a dying amusement park in the south, Joyland features a ghost and a serial killer, but the real heart of the novel is a coming of age story, one that took me vividly back to my own youth, working the rides at Uncle Milty's in Bayonne. I also enjoyed the hell out of The Cuckoo's Calling, by "Robert Galbraith". Gone Girl, by Gillian Flynn... which I came to late, but liked so much I went out and read all of her other books at once. Less hard-boiled, but equally engrossing, was Susan Orlean's biography of the famous film dog Rin Tin Tin, Rin Tin Tin: the Life and the Legend Woof! If there’s a book on this list that you think is a must-read, let me know in the comments below! -Alex W.
For just a few dollars, books can give you an enormous amount of valuable information that can help change your life. It’s practically high-robbery. So take advantage of this and read as much as you can. This article was based on several articles. The sources can be found here, here and here. Newer PostWhat Dr. Peterson Got Right & Wrong About "A Billion Wicked Thoughts"